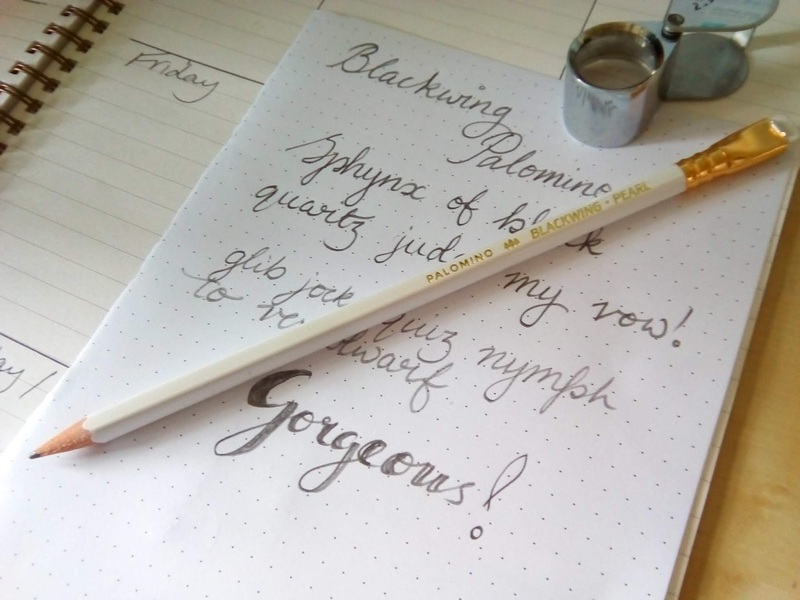 Her Nibs: Blackwing Pearl Pencil | A Review | A Convert! 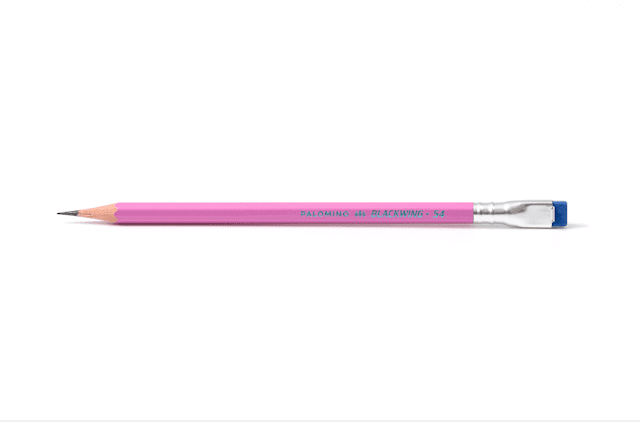 The first time I'd encountered Blackwing pencils was on the Bureau Direct website last year and while I'd admired the pencil itself, I marvelled at how anyone would be willing to spend about thirty quid on a box of pencils. Now that I've been using it - daily since I received it - I can barely bring myself to use another pencil. Before I wax lyrical about the Pearl, let me just introduce you to the company, Blackwing, in case you've never heard of them. Originally produced by the Eberhard Faber Pencil Company in the 1930s, the Blackwing was the weapon of choice to draw famous characters such as Bugs Bunny. Sadly, in the 1990s they were discontinued. The pencil, of course, had its devotees and vast sums of money exchanged for the long-out-of-production stick and in 2010 the folks who are now 'Blackwing' were able to produce it once more. And once more it was achingly hip. And expensive. Well, I say expensive, but only because they come in boxes of 12 and 12 pencils would last me years (allowing for loss, droppage and inadvertent pilfering by family members). Buying in the UK will set you back about £30, which works out at £2.50 per pencil which isn't bad at all for a really attractive writing implement. Buy them in the US, however, and they will set you back $22, which is about £17.00. That's one heck of a price difference! The 602 - 'Half the pressure, twice the speed', with eraser - firm, light graphite. So, lemme wax lyrical about the Pearl. I'll start from the outside in. The shape is semi-hexagonal and easy to grip and doesn't roll off the table and shatter your lead core *crosses self* May this fate never befall your pencils. The insides comprise of Japanese graphite - with clay for hardness and wax for softness. The Pearl has a fairly soft, fairly dark graphite which is a delight to write with. It is a balance between the graphite of the 602 and the Blackwing. Although the softness means that you need a sharpener on hand to keep the thing in tip top pointy condition. I meant to cut that image down before I loaded it up, sorry! The wood that surrounds the graphite core is incense cedar which has a fine, straight grain. THAT means the pencil sharpens easily and quickly without your sharpener getting filled with evil little wooden shards. And it does sharpen really well, leaving you with beautiful long ribbons of cedar wood. I guess this is all very well and good, but how, I hear you ask me, does the darned thing write? Smooth, beautifully smooth. Lovely dark lines. No hard grip or effort needed, it just dances across the paper. Yeah, I'm a little bit in love and may even be turning into the sort of hipster chick that seeks out every single one of their limited edition creations. If I don't procure, for example, one of their Exquisite Corpse pencils, I might sulk. A lot. The team of artisans over at Blackwing are not just about the pencils, but also about the accessories, including notebooks ... one of which Scribble also sent me. Which I'll be sharing with you directly!